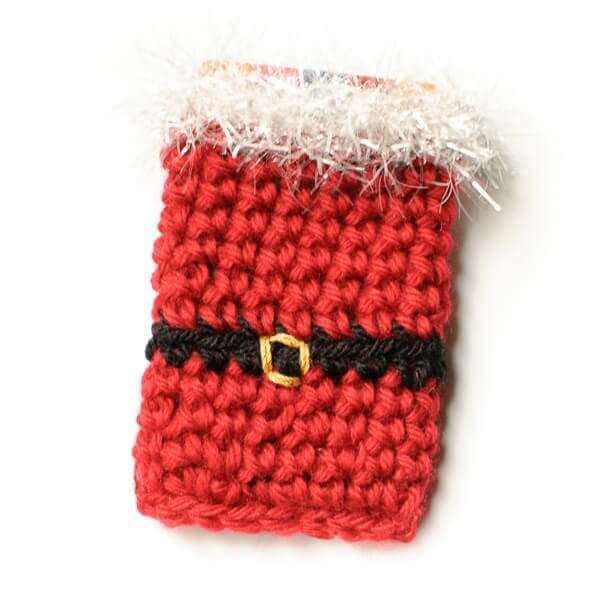 I am so excited to share today’s pattern … this adorable Santa crochet gift card holder! Awhile back I shared my patterns for these basic crochet gift card holders. 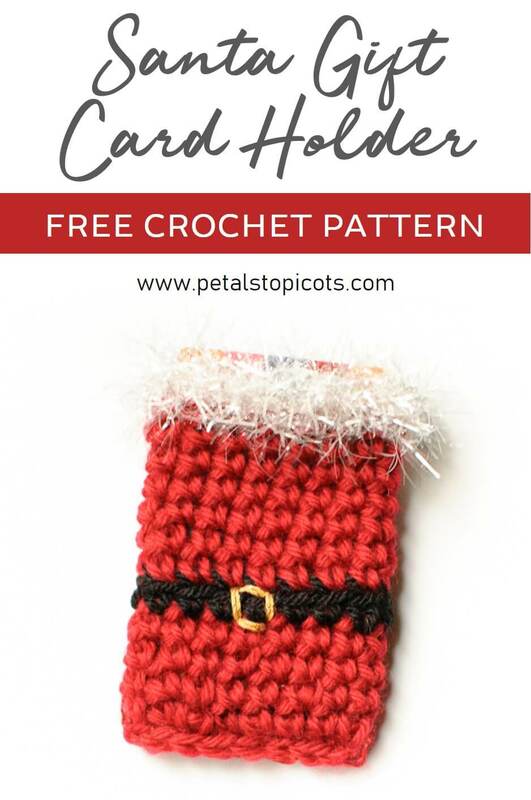 And when I saw how Nicole Gerbe added a Santa twist to the pattern with her gift card holder project here on Ravelry, I knew I wanted to share her idea with all of you as well. So with her permission, I worked up a pattern for you to make one too. Hope you enjoy it! Thanks so much Nicole for the inspiration!! Want to knit one too? See the knit version here. Finished holder is approx 3 ½ in. high by 2 in. wide and should fit standard sized gift cards. With red, ch 16, Sl st in furthest ch from hook to form a ring, do not turn. Round 1: Ch 1 (does not count as st here and throughout), work 1 sc in same ch as join and each ch around, join — 16 sts. Rounds 2 through 4: Ch 1, work 1 sc in same st as join and each st around, join, drop red yarn after Round 4 — 16 sts. Round 5: Join black yarn, ch 1, work 1 sc in same st as join and each st around, join and fasten off black yarn — 16 sts. Rounds 6 through 11: With red yarn, ch 1, work 1 sc in same st as join and each st around, join, fasten off red yarn after Round 11 — 16 sts. Round 12: Join glittery eyelash yarn, ch 1, work 1 sc in same st as join and each st around, join and fasten off — 16 sts. To close bottom of holder, turn piece around so that Row 1 is now on top, flatten cylinder; working through the unused loops of the beginning chain, pull up yarn in first loops, ch 1, Sl st in each pair of loops across. Fasten off and weave in ends. Now grab your needle and gold crochet thread and stitch a little square in the center of your black row for a belt buckle embellishment. Thanks for the free pattern! I featured this pattern link and post on my blog after being inspired to change up the colors a bit and do something a little less traditional, and a little more girly. Perfectly adorable! This was a have to, for my Top FREE Pattern Pick of the week! Thank you so much, Colleen! So glad you liked it! I featured this in my first Daily Dose of of EyeLoveKnots Finds – http://eyeloveknots.blogspot.com/2014/12/daily-dose-of-eyeloveknots-finds.html. Very cute gift card holder! Thank you for the opportunity to share. Thanks for sharing such a wonderful pattern. Love it. Thanks for sharing, what a cute idea!